One month from today, a record-setting race will be held in Toulouse, France. Teams from around the world will race nano-scale vehicles built from less than 100 individual atoms, at blistering speeds of up to five nanometers per hour. To put that in perspective, it would take these microscopic cars almost 37 million years to drive a single mile. Organized by the National Center for Scientific Research in France, the NanoCar Race, the first of its kind, will take place on a tiny highly-polished gold disc chilled to -454 degrees Fahrenheit, on tracks just 100 nanometers long. So how will spectators and teams see all the action? Through images created by the CNRS’ customized scanning tunnelling microscope that features four scanning tips for observing, and piloting, the incredibly tiny race cars. Because of those limitations only four teams will actually get to participate in the race. France, Switzerland, Germany, Japan, Austria, and the United States, have all entered the competition, but the final race lineup doesn’t appear to be available yet. We asked for the information, and we’ll update when we hear back. Though the cars can only be 100 atoms in size—every racing league has its rules—teams are free to design them however they think is ideal. Some work like tiny windmills, while others roll on four reels like the human-scale race cars we’re more familiar with. 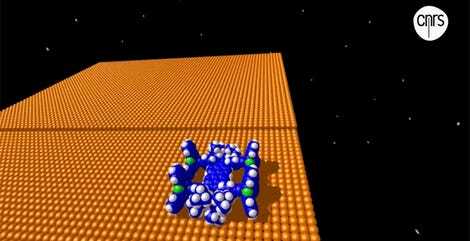 What’s universal across all the nanocar racers, however, is that none of them have an engine. All of their power will instead come from the electron microscope’s scanning tips, which will charge up the vehicles with electrons, activating whatever mechanism each team has engineered to send its car speeding off. As we noted before, the vehicles move just five nanometers per hour, so progress will be painstakingly slow, and there’s always the chance the electrical charge will destroy the cars. After 36 hours, whichever team’s vehicle has travelled the furthest, will be given the checkered flag. So why exactly is a race you can’t see or hear exciting? The fringe benefit to the competition is that researchers will have to find new ways to build atomic-scale machines. One day, cars like these might be driving around the insides of our bodies as part of medical procedures. The automotive industry has benefited greatly from the breakthroughs and advancements made in auto racing, and hopefully, the same will happen for nano technology thanks to this competition. Just don’t expect to see any spectacular multi-car pileups.